It’s worth putting that headline in caps. 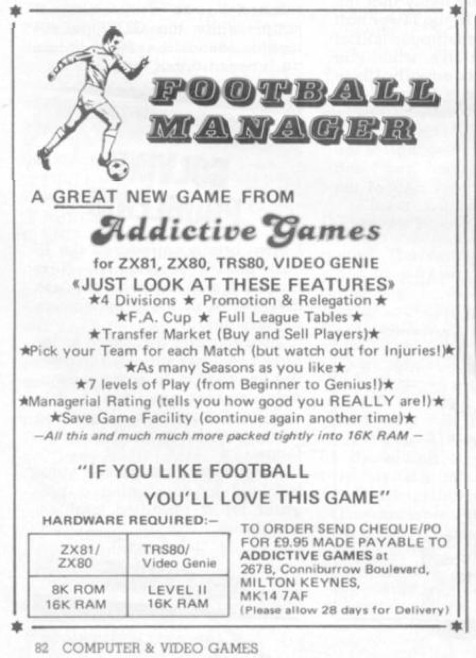 It was January 1982 that the first advert for Football Manager (my original game) appeared on the newstands in Computer and Video Games magazine. 30 years on, that foundation game has grown into a genre of computer games. My original game was very playable, and very popular, spending years high in the Gallup charts of the time. I still hear regularly from people who loved and still love playing it. I am proud of what I created. I believe I can still write good enjoyable games and soon I will be launching a new Football Manager type game for the iPhone. And to highlight a link to the pdf of the magazine here. “Packed tightly into 16k”. Amazing. These days it’d cost much more in system resources to produce something that did the same thing on today’s platforms.